Good morning! Well the day has finally arrived that I can share my sneak peeks of the new stamp sets from Peachy Keen Stamps that will be release this Friday. I know I say this every month, but you are just going to LOVE them! How Kathy does it month after month, I'll never know, but I'm so glad she does what she does so well! It sure makes me, and a LOT of folks happy, so keep it up, Kathy, 'cause we LOVE 'em!! Here's a look at my cards, created with stamps from the new Stamp of the Month Club set, as well as the Peachy Picks Kit. Both of these clubs are subscription based and will have all this peachy goodness arriving at your door like clock work each and every month. The price can't be beat, either, so sign up today!! Isn't this little chipmunk adorable? She was so much fun to color with my Copics, and the patterned paper that's in this month's Peachy Picks Kit is unbelievably GORGEOUS!! Heehee! Well, what can ya say about THIS sentiment? Pretty much says it all, doesn't it? LOL! I love that there are such fun sentiments included in some of these sets. You've just gottal love sharing cards like these with your bestest friends!! What FUN!!! I did LOTS of paper piecing on this cutie, as well as a good amount of Copic coloring. I think this concludes my line up of projects to share with you today. 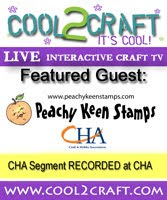 Be sure to drop by The Peachy Keen Stamps Blog to see what my DT Sisters have created as well, and don't forget to drop by tomorrow and Wednesday, because the sneak peeks will continue! If you're a member of Facebook, here's the link to our online party event. Join us today and let us know you're coming to our Release Party on The Peachy Keen Connection, THIS Friday, beginning at 6 PM. So happy you could drop by today! Have a blessed and beautiful day, and HAPPY stamping to ya! Lorie, your cards are fabulous ! I love the different DP , your layouts and the new images are super sweet. I love that little chipmunk!! The way you colored it makes him so adorable!! Both cards are fantastic. Your coloring is just super Amazing. Love your creations. Both cards are so very cute! I especially like the turkey image - it is funnier than all get out! These cards are great--love the fall colors! Lorie, I love your cards they are just to cute! My favorite is the turkey one, So adorable with the chef's hat on:)lol. So beautiful Lorie! The layering, the design, the coloring, the AWESOMENESS!!! Oh Lorie! These are fabulous!!! love the fall colors... and of course, your coloring! What they said and MORE!!! You are AMAZING!!! So cute. Love the humor. These two cards are just FABULOUS! I love them both but the second one is really cute! Very nice work Hun & TFS!! !